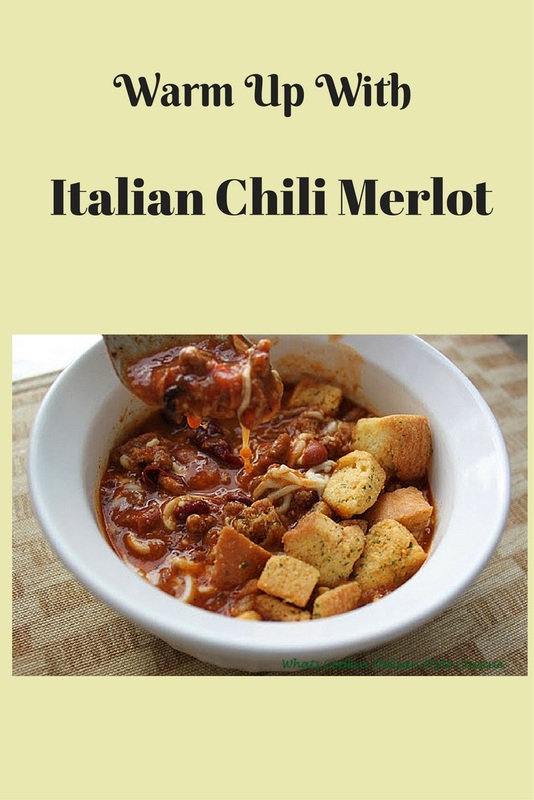 This Italian Merlot Chili is the perfect way to feed a large family. The chili is different because of the wine and the white beans. The sauce makes this chili so amazing and over the top, I love all the toppings that give it even a bigger taste. 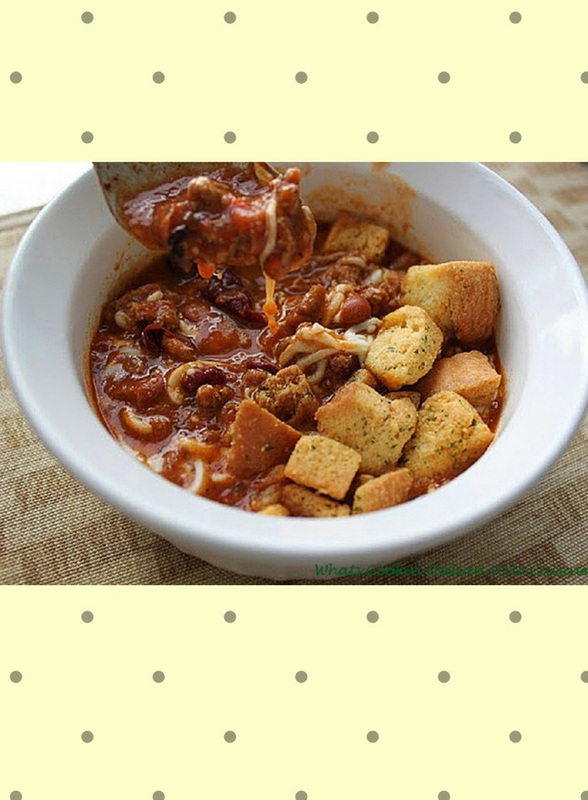 Melted cheese and Italian croutons make this Italian American chili a hit every time. One thing I love about making chili is having leftovers, so make a big pot! I usually make double the amount. There is so much left, I will freeze some for another meal. On several occasions when we have leftovers, I like to use it up on top of tortilla chips with all the toppings. Other times I put it over pasta or rice. It's such a great starter for many meals. Anyway, you serve it's an all-around great meal that goes a long way for a large family on a strict budget. The flavors of the beef sauteed with garlic really kick up the taste and then add the wine, just puts this over the top. You can add this chili to a flour tortilla, roll them up, top with shredded cheese. Bake them for a delicious casserole of Italian Merlot Chili baked tortilla. We love that fresh taste of the sauce, fresh herbs and chili was the craving of the day. Today we will be having Italian Merlot topped with mozzarella and garlic croutons! If you hate standing over a hot stove, just throw everything in a slow cooker! If you're in a hurry this is the perfect solution a slow cooker. I use mine a lot in Florida since I never want to heat up the house in summer. But in winter time I like to use the stove top. Hope you enjoy this recipe, it's one of our favorites! 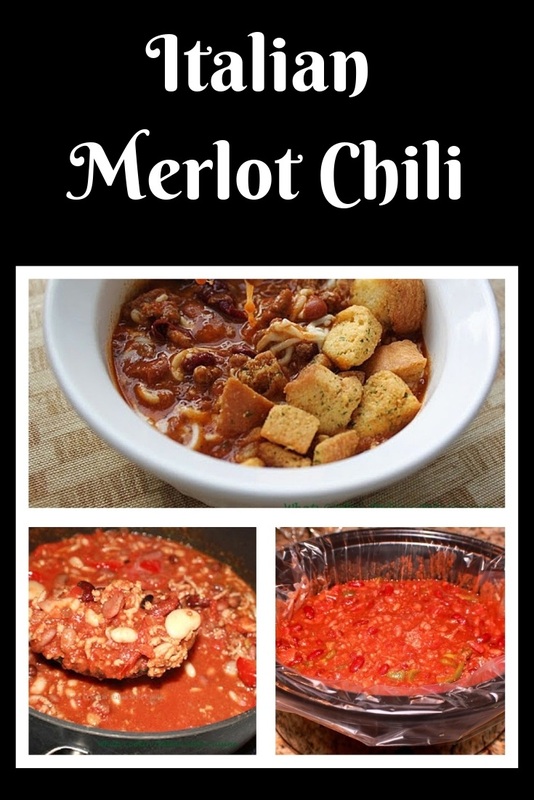 The best thing about Italian Merlot Chili is how quick it comes together for a delicious meal. It's easy, inexpensive and feeds a crowd. The toppings can be a banquet too! Shredded mozzarella, sliced olives, even a tablespoon of Ricotta cheese on top is amazing! Add this to the top of a leafy green salad and some garlic croutons and you have a whole other meal! You can make the most marvelous nachos with this chili. Line your plate with some tortilla, top with sour cream and shredded cheddar and you have a whole meal. I delicious hearty chili with wine, a perfect Italian comfort meal. Use any kinds of beans you like with like white kidney beans. 2 lbs of fresh plum tomatoes stem cut off (leave three tomatoes out and cut up into cubes set aside), put rest of the whole tomatoes through the food processor until smooth. Saute meat first on the stove top ( if using slow cooker too ) with garlic. After pink is all gone, drain out all the oil from pan. Add beans and stir in tomatoes that are blended with wine and all other ingredients to includes spices, cook on a low burner for around 1 hour, 6 to 8 in the slow cooker. Serve with garlic croutons or crusty garlic bread and shredded mozzarella cheese on top. 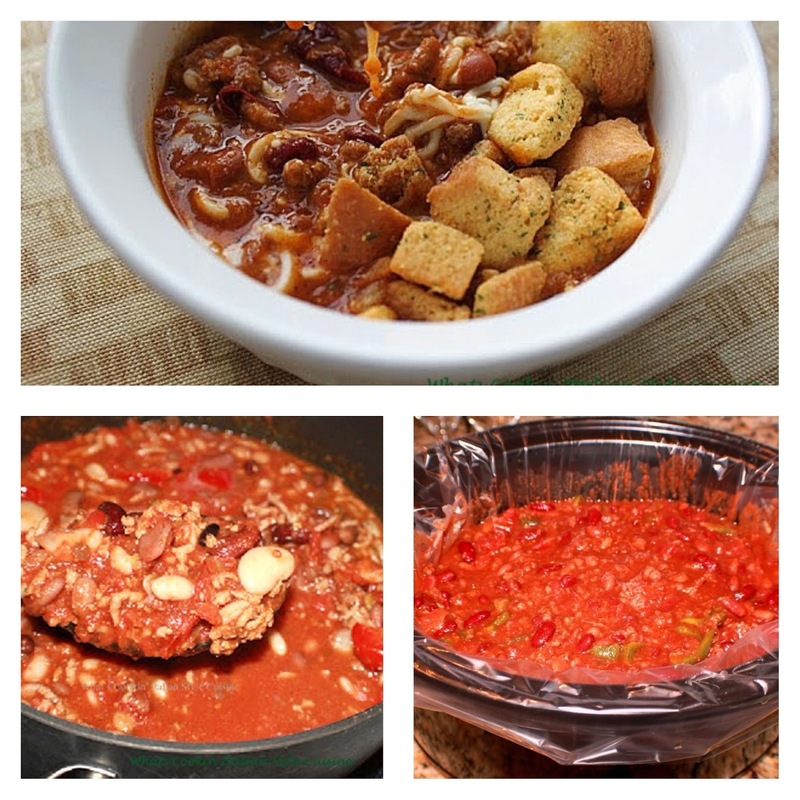 Try Some of my Favorite Soup Recipes! Loving this lamb chili! WOW! sounds and looks so scrumptious! I'm a big lamb fan, and when I find it in the store I grab it. I'll add this to my lamb list. This chili sounds amazing! I love that you use lamb and Burgundy wine here, wonderful flavors! 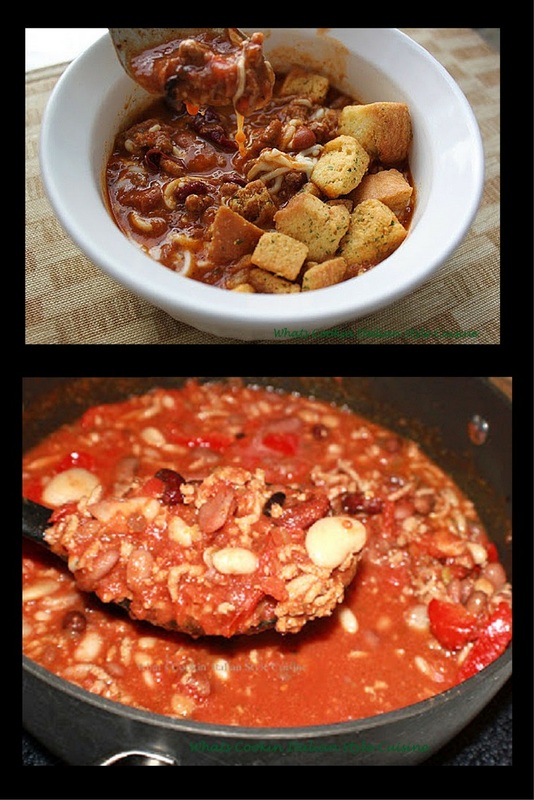 I love lamb but have never made chili with it, this really looks great! Nice! I love good plum tomatoes. So fun to make it Italian style - and this even works for my winter cooking! Hearty and filled with flavor. This lamb chili looks awesome. As a big fan of lamb, I must try this succulent dish. This chili definitely has wow-factor! Love it! Perfect winter comfort meal for sure! Tomatoes for .99lb What a steal! The photo is absolutely gorgeous Claudia. So much so, I can taste that chili down here!! What a fancy recipe for chili with the lamb and wine! Incredibly delicious and comforting! So many great flavors in this dish. I've never used lamb in chili but I imagine it would be wonderful. Great idea! I made a big batch of chili last night---now I wish I would have added some Merlot! Great idea! The sauce must taste incredible with merlot. I bet I would like it! 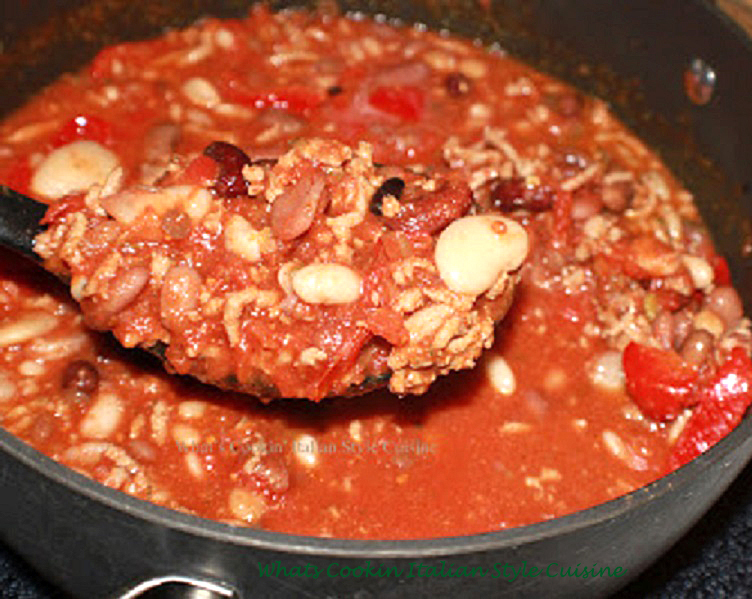 This Italian Chili sounds delicious and love all the leftover ideas. Looks amazing!! Can't wait to try. Chilli is the perfect meal at this time of year. I add white bean to mine too. You can't beat real Italian food and this looks so comforting! 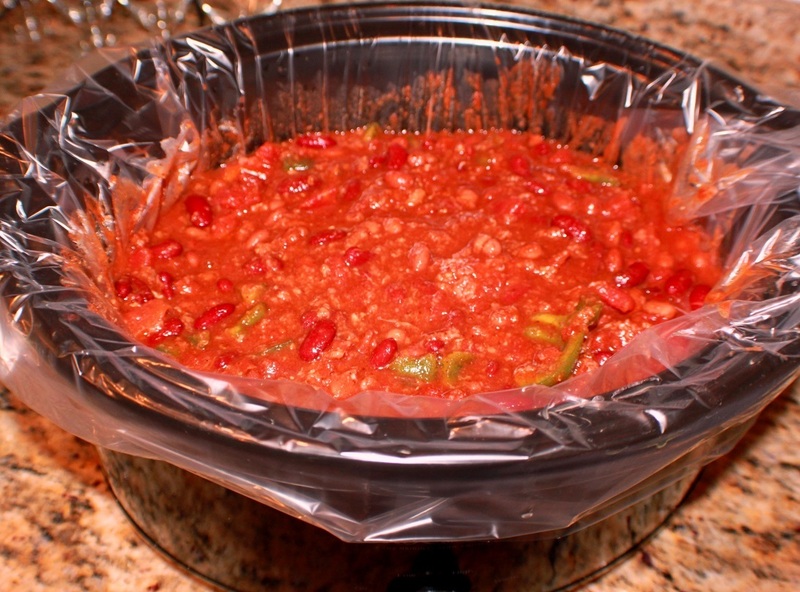 This chili looks like a perfect way to warm up, and don't you just LOVE crockpot liners!! Best thing ever! It is even still pretty chilly in Florida and I would love to try this. I love how garlicky it seems. We love garlic in our home!